We were in an antique store in Shipshewana, Indiana, a couple weeks ago where we had a nice conversation with the owner. He had a little workshop in the back of the store and he was working on a pair of shoes. He was very knowledgeable about shoes and I mentioned the old boots I have that once belonged to my great-great-grandfather Louis Breuninger. My mom always said that Louis brought these boots with him from Germany in about 1838 when he came to this country. For as old as these boots are they are in near pristine condition. In fact, they look so good that I always joked that they must not have fit him very well and thus he hardly ever wore them. But I doubt people back then had a lot of extra clothing like we do today. Perhaps these were his dress boots and if so he probably took very good care of them. Maybe he even had them resoled a couple times. The soles look like new, too. 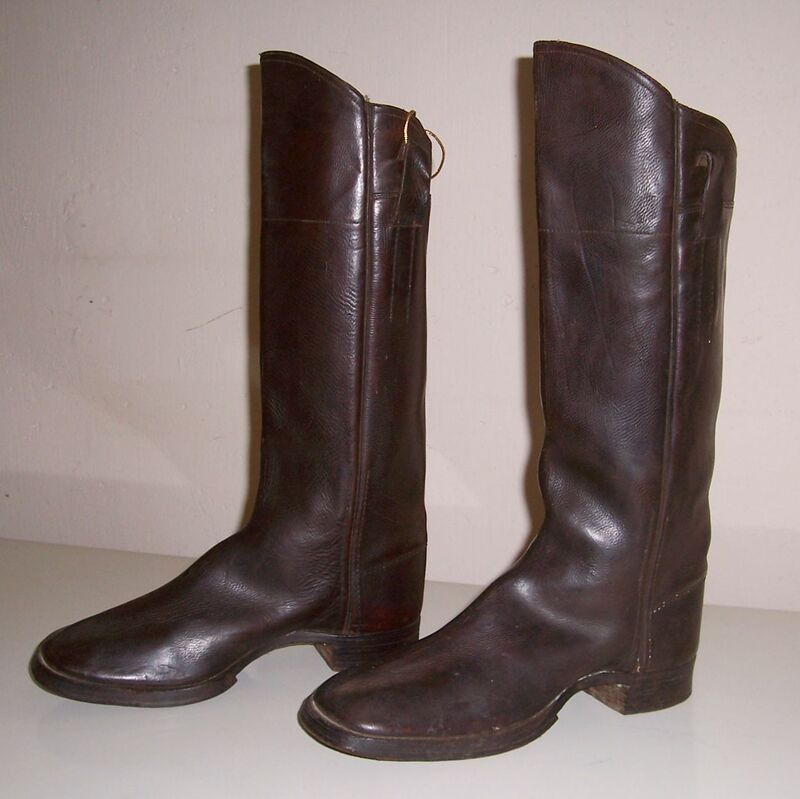 The shoemaker in the antique store started asking me all sorts of questions about the details of the boots. Were they straight on top? Were they left and right or generic for either foot? Where were the seams? What was the stitching like? Gosh! I never really studied the boots that carefully and could not answer most of his questions. So I told him that I would just bring in the boots on our next trip to Shipshewana so he could examine them himself. We go up there several times a year and I will have to write about his assessment of the boots at a later date. But one of the questions he asked me was if they were “found shoes.” I had no idea what he was talking about. But he went on to explain found shoes and I found the whole story very interesting. I had never heard of found shoes I and I would like to hear if any of my readers know anything about this custom. He said that years ago, from the 1300s to the early 1900s, people used to put an old shoe in the walls of a house when they built the house. Usually it was the northwest corner, according to him. The old shoe was placed there for good luck, or to keep bad luck away, and mainly to avoid a broken leg. A broken leg would have been disastrous for anyone in the house back then, but particularly for the head of the household. He said they often put one shoe belonging to each spouse and sometimes a shoe from each of their children. This was a superstitious custom practiced by several nationalities—Germans, English, French, Americans, and others. Their nationality did not make any difference. He said it was done in the old country as well as in America, and done in America into the early 1900s. He even had at least one found shoe in his store. It originally had a buckle on it and reminded me of a Puritan’s shoe. It was very worn and the heel was worn down on the outside. I did a Google search about this superstition read several articles about it. I learned that they are usually called “concealed shoes” and they are pretty much as the store owner said. Shoes are hidden in the building structure, often found in chimneys, under floors, above ceilings, around doors and windows, and in the roof. People believe they were concealed as magical charms to protect the occupants from evil beings such as demons, ghosts, and witches. Others feel the old shoes could have been an offering to a household deity, which would protect the house, or to bring fertility to a female member of the house. Other thoughts are that shoes seem to have had a special significance because a shoe is the only item of clothing which takes on the shape of the person wearing it. A single worn shoe was hidden so that a malevolent spirit could not steal it and take away the protection the shoe gave. Finding these shoes today can show us what ordinary people were wearing on their feet hundreds of years ago. 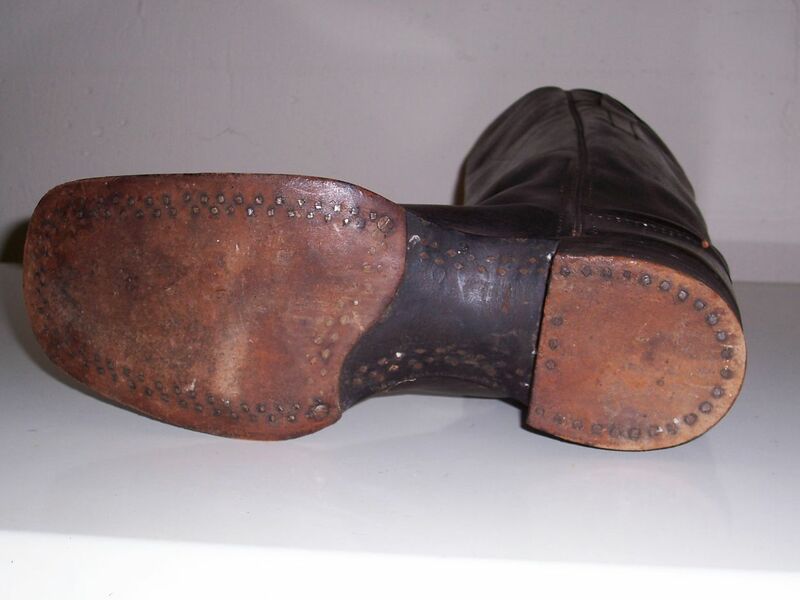 I also read that person from Zweibrücken, Rhine Pfalz, found an old pair of shoes in a house built in 1903. That is not all that far from where some of my ancestors came. I would love to hear from anyone who has heard of or has found concealed shoes in an old house. 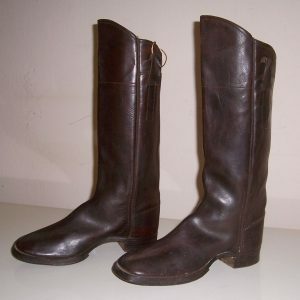 And in the future I will report what the shoemaker has to say about great-great-grandfather Breuningers old boots. Concealed Shoes, Northampton Museums & Art Gallery, blog posted 19 June 2012. Yes my grandma Black said her father Loren Carr from Rockford was a paperer and would often find children’s shoes in the walls of the homes he worked in. Grandma said they were often dropped down unfinished walls from the attic to ensure good health of the occupants. Thank you for that information. It is so interesting to know that was also done in this area, evidently one of those things people just did for good luck.